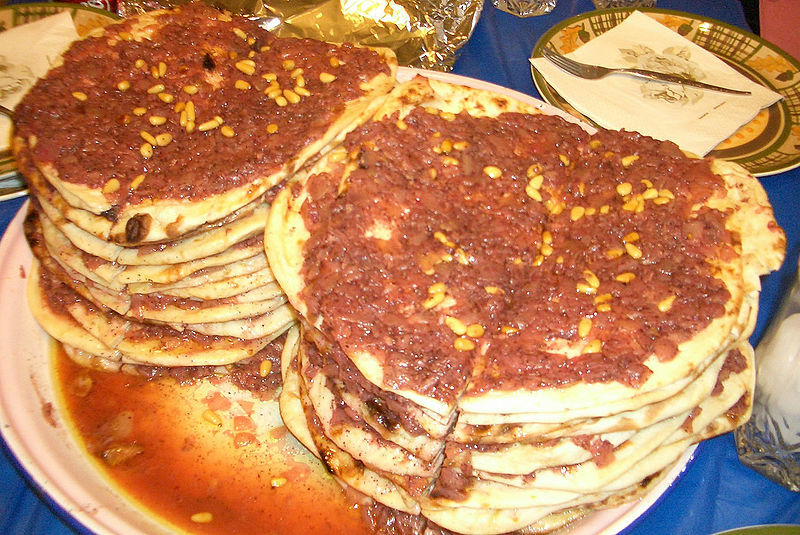 Musakhan is a Palestinian national dish. It is composed of roasted chicken baked with onions, sumac, allspice, saffron, and fried pine nuts atop one or more taboon breads. Sliced and toasted pine nuts or almonds. 1. Combine the spices with the salt and rub half ofthis mixture over the chicken. If you have time, leave for up to a day to marinate. If not, cook straight away. 2. Heat half the oil in a pan. Add the chicken and brown. Transfer to a deep oven dish, add half of the stock, cover and bake in an oven at 180°C for 45 minutes. 3. Use the pan you browned the chicken in and caramelise the onions in the remaining oil and spice mix. 4. Lay the bread in an oven tray, spread half the onions over the bread then place the chicken pieces on the bread. Ladle most of the remaining stock generously over the top, leaving some to baste the mixture with whilst cooking. Bake again for about ten minutes, adding stock and oil to until the bread is crispy on the outside. 5. Top with the toasted nuts and more onions.